3800 RPM. Motor with replaceable brushes provides power and durability. Front D-handle design reduces force needed to pull handle when cutting. Quick-release material clamp allows for easy material cutting and removal. Cutting fence with miter adjustment allows up to 450 angles to be cut. Heavy duty steel base provides stability while cutting. Spindle lock for easy blade changes. 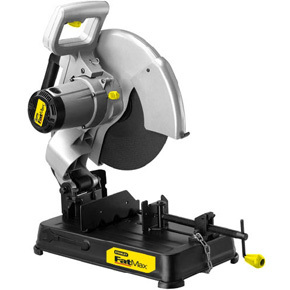 Ideal for cutting wood, steel, masonary and ceramic tile. 3-Year limited warranty.